Hi Everyone! Welcome to Gina K. Designs Mega Wreath & Mini Wreath Builder Blog Hop! So glad you have stopped by! 🙂 You should have landed her from Miss Hannah’s Bag! <3. We are so excite to share some projects made with these templates and we are also featuring the newly released stamp sets Vibrant Blooms, You Make Me Happy, and Mini Wreath Builder Set. Oh so many ideas and never enough time! Haha! 🙂 Let’s get started! 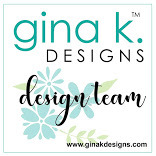 Be sure to comment on all the blogs for your chance to Win a $50.00 Gift Card From Gina K. Designs. A Winner will be announced on March 1st. over on Gina K.’s Blog. Here are a couple projects made using the New Mega Wreath Builder. The First one Features the Newly Released Vibrant Blooms Stamp set! I have really enjoyed using the flowers in this set! 🙂 On this card I used the large Gerber Daisy looking flower and stamped it on a piece of 6″ X 6″ card stock. I started with the Red Velvet, then stamped Coral Reef, Sweet Mango, Wild Dandelion, Jelly Bean Green, Turquoise Sea, Blue Denim, & Wild Lilac. Stamped the Greeting in Jet Black – Amalgam Ink. Layered it on a a piece of Black Onyx Card Stock and used some twine from my stash to tie around it. Added some bling to finish it off. Premium Dye Inks – Red Velvet, Coral Reef, Sweet Mango, Wild Dandelion, Jelly Bean Green, Turquoise Sea, Blue Denim, & Wild Lilac. This next card… Well, I really love this cluster of leaves and had to make another wreath using it and the New Gray Inks! I started with the 4 3/4″ X 4 3/4″ piece of paper and the template that is the same size. I Stamped the leaves in the Soft Stone & Stormy Sky Premium Dye Inks. I then put the wreath in the square position, used the other wreath builder templates on top of my project, then added the first large circle, then the smaller circle. Put a piece of tape over the stencils to hold them together and sponged the Dusty Rose Center. Removed the smaller circle and then stamped the greeting in Jet Black Amalgam Ink & Stamped the Flower in the Jet Black Amalgam Ink on another piece of paper and colored with Pencils. Added this layer to a piece of Soft Stone card stock. Then die cut the flower and Popped it up on the card. Added some bling, twine, and sequins from my stash. The Card Back is 5 1/2″ wide X 6″ tall, I scored a line 1″ from the top of the 6″ side. Attached the Dusty Rose 4 1/4″ X 5 3/8″ panel that has been dry embossed to a Black Onyx panel 4 1/2″ X 5 3/4″. Then added Connect Glue to the top back of the Black Onyx panel so it attaches to the top inch of the card base. Then I popped up the Focal Layer making sure to only attach it to the Dusty Rose layer. The white you see behind the Black Onyx and Focal layers is the card base. Up Next is You make Me Happy Stamp set used with the Mega Wreath Builder Template. For the focal area. I used the 4 3/4″ x 4 3/4″ template and piece of white layering weight card stock & added the circles to the center, then sponged the center with Key Lime and Jelly Bean Green. Removed the Circle templates and added the dot stamp from Lisa Hetrick’s Today & Always Stamp Set to the Misti and stamped it around the card. Stamped the flowers and Greeting in Amalgam – Jet Black. Die cut the flowers and jar images. For the jar I used a piece of scrap paper and used Jelly Bean Green and Key Lime to drag across the paper then cut out with the die. Popped up some and then glued the others. Added the bow and layers. 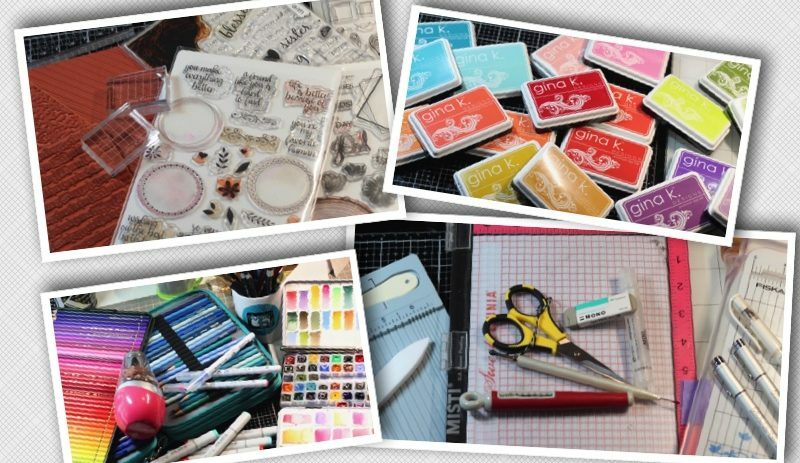 And Featuring the Mini Wreath Builder and Stamp Set I have two projects. First is this tag. Made with Gina K. Designs Decorative Tag Die Set along with the Mini Wreath Builder Stamp Set and Template. What beautiful creations! The pink is my favorite of all the beauty you created and I’m not even one that likes pink much. Fabulous projects! I love the rainbow flower wreath! Love all your projects. The coloring is so inspiring! Your work is stunning! You are so talented!! Thank you for the inspiration! Wow!! The grays with the pink are awesome. I love grays with pink. The little cards are cute. Love all your projects Karen. The are beautiful! Love all of your projects and can’t wait to use some of the new soft grays. I LOVE your pink and gray card–just beautiful! What beautiful projects!! I am so excited about the mega wreath builder and absolutely love the rainbow flower wreath you created with it! I love all your examples but, most particularly, the pink and grey. Just stunning!! Such beautiful projects! I love the wreath of rainbow flowers! The pink and gray wreath is stunning! All your designs are spectacular!